Anything that requires twelve steps is not worth doing. 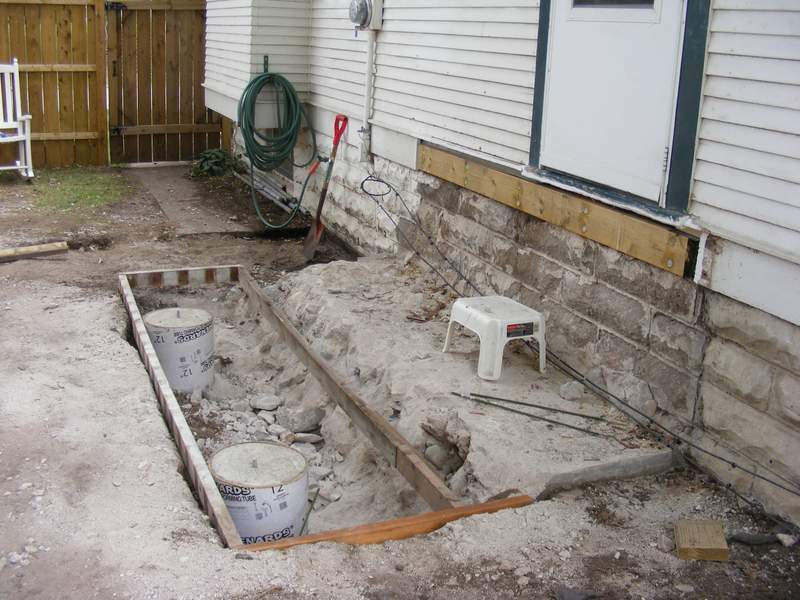 Recently, I wrote about demolishing concrete steps from the side of our house. Writing that post, and looking at those photos, brought it all back. I had to go and have a bit of a lie down. Talk about suffering for your art! Of course, back then with the stoop demolished, there was no time to recover. We had a giant step up to the side door that we needed to do something about. That meant designing and building new steps. 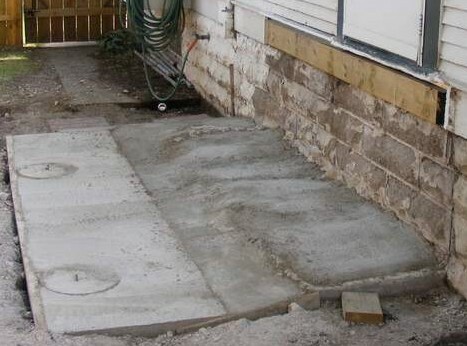 After the stoop was gone, there was a giant step up to the side door. 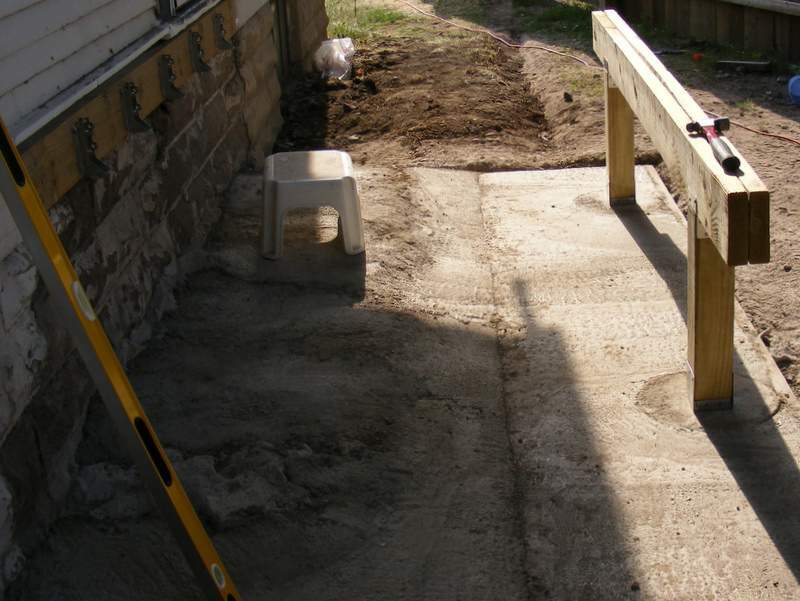 One of the things we liked about the old steps was the large platform area outside the door. It was easy to maneuver large items in and out of the house. So, I wanted to keep that feature with the new steps. Even with the plastic stool, it’s still quite a big step up into the house. The platform would be built like a small deck, with a ledger board attached to the house with lag screws. At the other side, a bearer would be put on top of two four-inch square stumps that would be stood on concrete piers. The piers were built using 12″ diameter cardboard tubes. One bolt was set into the top of each pier to secure the bottoms of the stumps. That looks a lot tidier, but it’s still a big step. 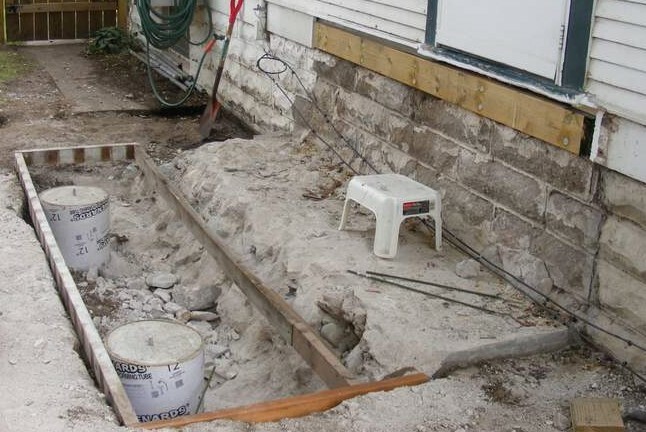 A base of crushed rock and concrete was put into the bottom of the trench, and four-inch thick concrete was poured into a rectangular form around the piers. 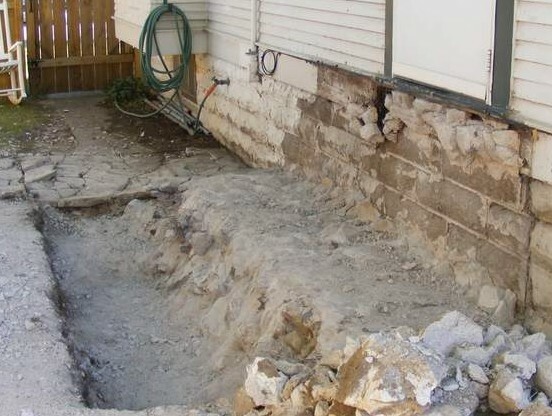 Finally, hollows in the rough remains of the old stoop were filled with concrete, ensuring that drainage was away from the house. Now we’re getting somewhere…we can either take a big step or a big leap! We fitted the stumps and doubled up two joists to make a bearer. The bearer supports one end of the joists, the other ends go into the joist hangers on the ledger board. At this point, we started to have some hope that it would soon be easier to get into the house. This entry was posted in Construction, Outdoor Building Projects, Porch, Yard & Garden and tagged deck, drainage, garden, woodworking, yard. Bookmark the permalink.